Giving us the time we needed to fall in love. It took time, but it was worth the wait. Everyone gathering around us congratulating, celebrating. Unconditional love is what we share with each other. This poem and the included images are Copyright © 2008 by Colin Kelly (colinian). They cannot be reproduced without express written consent. Codey’s World web site has written permission to publish this poem. No other rights are granted. 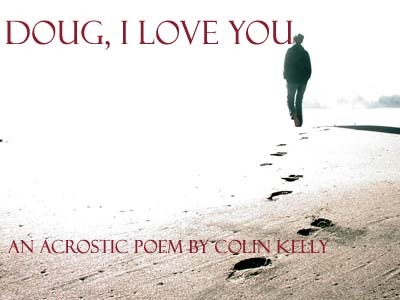 Doug, I Love You was originally published in The Hub Acrostic Project for acrostic poetry. If you enjoyed reading this poem, please let me know! Authors thrive by the feedback they receive from readers. It's easy: just click on the email link at the bottom of this page to send me a message. Say “Hi” and tell me what you think about Doug I Love You. Thanks.